PCR and DNA sequencing are two important techniques in Molecular Biology. 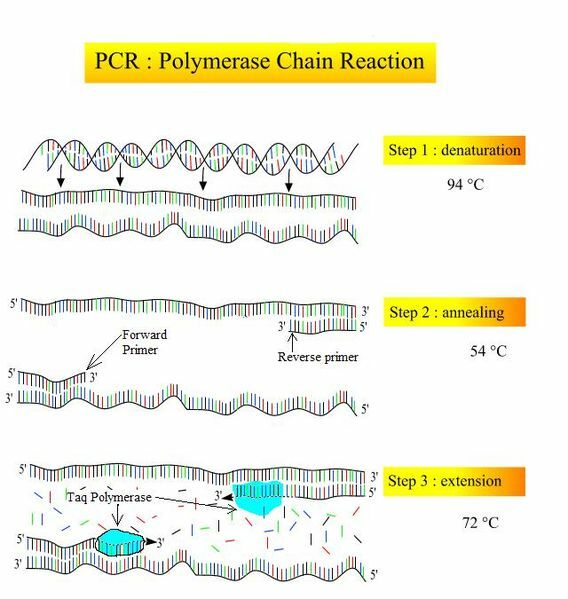 Polymerase Chain Reaction (PCR) is the process which creates a large number of copies of a DNA fragment. DNA sequencing is the technique which results in the precise order of the nucleotides of a given DNA fragment. This is the key difference between PCR and DNA sequencing. PCR is one of the major step involved in DNA sequencing. Polymerase Chain Reaction (PCR) is a DNA amplification technique used in Molecular Biology. It produces thousands to millions of copies of a particular DNA fragment. This method was developed by Kary Mullis in 1983. In this technique, the fragment of DNA to be amplified serves as the template and DNA polymerase enzyme adds complementary nucleotides to the primer which is available in the PCR mixture. At the end of the PCR reaction, many copies of the sample DNA are synthesised. 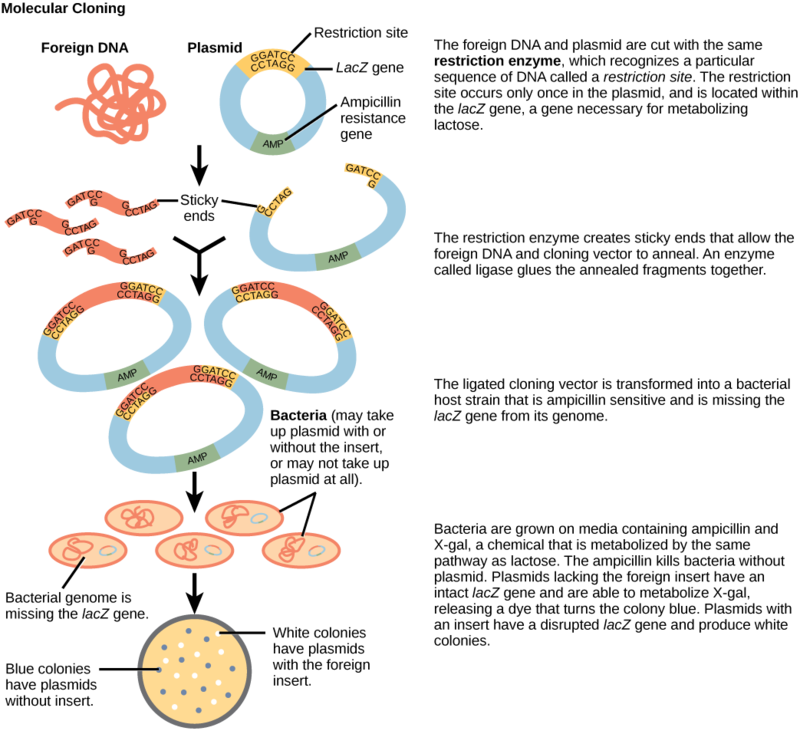 There are different components of the PCR mixture, including DNA, DNA polymerase (Taq polymerase), primers (forward and reverse primers), nucleotides (building blocks of DNA) and a buffer. PCR happens inside a PCR machine, and the correct PCR mixture should be loaded into the machine, and the correct programme should be driven. This technique enables the production of thousands to millions of copies of a particular section of DNA from a very small amount of DNA. PCR reactions occur in a cyclic manner to produce the visible amount of PCR products on a gel. 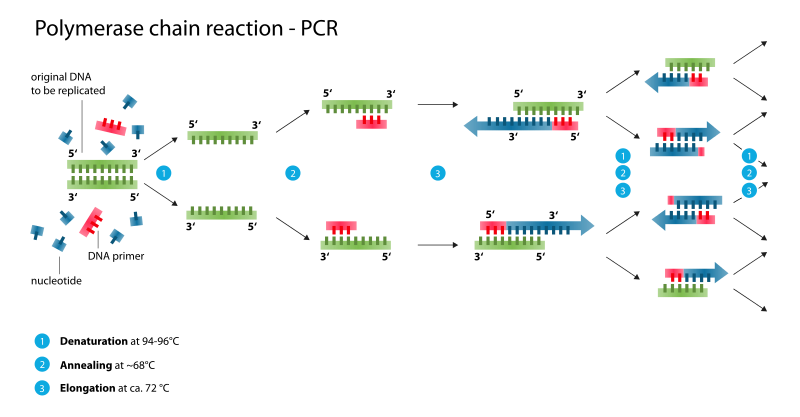 There are three major steps involved in a PCR reaction namely denaturation, primer annealing and strand extension as shown in Figure 01. These three steps are occurring at three different temperatures. DNA exist in double stranded form by hydrogen bonds between the complementary bases. Prior to implication, double stranded DNA should be separated from each other. It is done by giving a high temperature. At a high temperature, double stranded DNA denature into single strands. Then the primers should come closer to the flanking ends of the specific fragment or the gene of the DNA. Primer is a short piece of single-stranded DNA that is complementary to the target sequence. Forward and reverse primers anneal with the complementary bases at the flanking ends of the denatured sample DNA at the annealing temperature. Primers should be heat resistant. Once primers anneal with sample DNA, taq polymerase enzyme initiates the synthesis of the new strands by adding nucleotides which are complementary to the target DNA. Taq polymerase is a heat stable enzyme isolated from a thermophilic bacterium called Thermus aquaticus. PCR buffer maintains the optimal conditions for the taq polymerase action. These three stages of PCR reactions are repeated to produce the required amount of PCR product. After each PCR reaction, the number of the DNA copy is doubled. Hence, an exponential amplification can be observed in PCR. PCR products can be observed using gel electrophoresis and can be purified for further studies. PCR is a valuable tool in medical and biological research. PCR has a special value in forensic science since it can amplify DNA for studies from the tiny samples from the criminals and make forensic DNA profiles. PCR is widely used in many areas of molecular biology including, genotyping, gene cloning, mutation detection, DNA sequencing, DNA microarrays and paternity testing, etc. DNA sequencing is the determination of a precise order of the nucleotides – adenine, guanine, cytosine and thymine in a given DNA fragment. Genetic information is stored in the DNA sequences using the correct order of the nucleotides. Hence, finding the precise order of the nucleotides in a DNA fragment is very important to know about the structure and function of the genes. DNA sequencing protocol involves different processes. The first step is the isolation of interested DNA or genomic DNA of an organism. Using PCR (as described above), the desired region of the DNA should be amplificated. Amplified PCR product should be separated by the gel electrophoresis and purified. Amplified fragments are served as templates for sequencing. Sequencing can be done either following Sanger sequencing or high throughput sequencing method. Sanger sequencing requires capillary electrophoresis of resulting DNA fragments. Determination of the correct nucleotide order can be done by manual reading of autoradiographs or using automated DNA sequencers. Gene sequencing contributed to Human genome project and facilitated the mapping of the human genome in 2003. In forensics, DNA sequencing enabled identification of individuals which show unique DNA sequences and identify the criminals. In medicine, DNA sequencing can be used to detect the genes responsible for genetic and other diseases, find defect genes and replace them with correct genes. In agriculture, DNA sequencing information of some microorganisms is used to produce transgenic crops with economically desired characteristics. What is the difference between PCR and DNA Sequencing? PCR process creates thousands to millions of copies of the interested DNA fragment. DNA sequencing is the process of determining the precise order of the nucleotides in a given DNA fragment. PCR creates thousands to millions of copies of a particular DNA fragment This results in the correct order of the bases in a particular DNA fragment. PCR does not require ddNTPs. It uses dNTPs. DNA sequencing requires ddNTPs to terminate strand formation. PCR and DNA sequencing are very important tools in many areas of Molecular Biology. 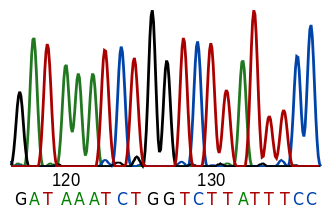 Amplification of the DNA fragments is done by the PCR technique while the correct order of the nucleotides of a DNA fragment is determined by the DNA sequencing. This is the difference between PCR and DNA sequencing. 1. “Polymerase Chain Reaction (PCR).” National Center for Biotechnology Information. 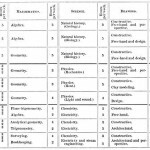 U.S. National Library of Medicine, n.d. Web. 21 Feb. 2017.